Up to 21 days prior to arrival - free of charge and the deposit will be refunded in full. Once in Cape Town is a hostel for adventurous and young at heart travelers, where you can tailor make your own experience. We believe that when travelling, the four most important elements of that “Once in a lifetime” experience include: Great Location, a great vibe, Safety and Good value for money. Once in Cape Town is located in Kloofstreet a vibrant area in Cape Town with lots of nice restaurants, sites and activities. Down the Street you'll find the popular Longstreet famous for its bars and clubs, there you can find a bar for every taste, so perfect to party all night long, but far enough from the noise of the city. Not in the mood to venture out? Fear not! Our relaxing back area with self-catering kitchen, outdoor fire-pit and meditation garden gives you space to work and chill. We have 3 in-house restaurants - the gourmet burger joint, Hudsons; a restaurant called Today Tomorrow that plays tunes throughout the week with one Caveat - only vinyl DJ's and cafe deli: Yours Truly - our in-house cafe where breakfast is served. The deli transforms into a hip bar for day-time merriment, and is open until 11pm. Local Captonians love this place - perfect to meet local friends. Reception and concierge are open 24 hours - book a surf lesson, a wine tasting trip, a visit to Cape Point, sky diving, shark cage diving and much more! Our staff love to travel and are city ambassadors who gladly answer all your questions and offer travel tips and advice. 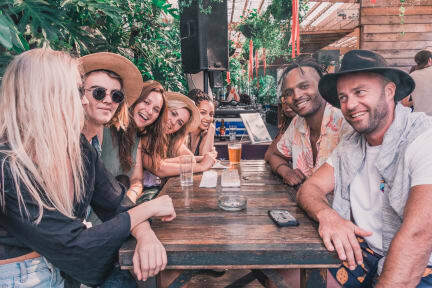 We invite you to join daily free activities like hiking Lions Head or watching the sunset at Signal Hill and make your stay unforgettable and meet new friends. Every room is Ensuite with private bathroom (even dorms) so no awkward night meanders here! The dorm beds are custom-made extra length, with a safety locking box and charging space for your laptop etc. The private rooms offer hotel-like privacy along with DSTV. Had the best stay here. Staff are super friendly, rooms really nice. The atmosphere is always good, best on the weekends though. Was super easy to meet people as a solo traveler. Location is perfect as so close to all the food places and bars. Would 100% stay here again if I return to Cape town. It's not the cheapest but it's worth the money in my opinion. 1. Great atmosphere & nice place to stay with friends /alone . 2. Near to table mountain, long street, V & A ,district 6 museum n other attractions. 3. Good breakfast. 4. My only observation is, staying in cottage was little disturbing for people resting/sleeping inside because of the noise from the folks enjoying drinks and dinner on the sittings beside the room in the evening ,otherwise I like it, love it n in future also I make an endeavour to stay at this place. It’s a great hostel, best in Cape Town. The rooms are all modern with nice clean bathrooms. Bunk beds have a storage locker for small bags and accessories with multinational travel electricity plugs as well as a large locker. Staff are great and friendly, very professional and you receive a welcome pack when checking in which is nice. The bar/cafe are great addition to the hostel and make it easy to meet people. Wifi is extremely good and the location is great! The facilities are that of a nice hotel, definitely worth it for a few more dollars than most accommodation. It's in a really nice area, and it's cool in that you can begin the party there but also just chill if you want. Great hostel with a great location and friendly staff! Probably the coolest hostel in town. Great spot with great atmosphere. The bar just outside the Hostel was lovely, on weekends expect a lot of foot traffic stopping by for drinks, gets quite busy but lively. Overall had a good time here. Amazing staff & bar with probs one of the best atmospheres at night in Cape Town. I suppose it depends on what kind of traveller you are- if you plan to use cooking facilities then value for money increases as they have a nice kitchen area with a good vibe. But if you're not using them you can probs find a hostel with cheaper beds and similar quality. Only negative note is the fan in the 2 bunk bed room isn't really placed well for cooling people in their beds. A pretty nice hostel, although I think I would have said 'a great hostel' had it not been for our experience checking in with the staff. I'm sure usually they're all super nice, but we wanted to make some changes to our original booking, okay fair enough that must've been annoying for them! But in any case you expect good service especially in a cool looking hostel you'd expect cool friendly staff, they were all clearly irritated with us and from then on seemed deliberately less helpful, shame. Bed bugs ruined our stay, and though we were switched to a better room to avoid sleeping in the infested beds, we had to beg for a compensation with a manager that tried to make us feel guilty for asking a free breakfast instead of offering the night! Aside from that point (probably not isolated given the blood stains on the bed sheets in both rooms we had), hostel is well located and offers good value. As there is no aircon, expect some really hot nights.